Traditionally, syllabi have been brief outlines that listed the scope and sequence of course topics, readings and assignments. Today, however, the syllabus has become a quasi-legal contract between a course instructor and students, exacting in grueling detail the rules, regulations and expectations for class – such as policies on laptop use in class or the rules for accepting late papers. To the extent that faculty members want to use the syllabus-contract to cover every eventuality, many syllabi have grown into 10-, 15-, even 20-page laundry lists of information required by the university (e.g., ADA accommodations), accrediting agencies (e.g., learning outcomes), departments (e.g., office hours) and even students themselves (e.g., detailed assignment rubrics). And while this information is important, the legalistic air of a modern syllabus can make them unwelcoming and intimidating lists of what students can’t do and the penalties for their failure to adhere. And to make matters worse, as David Parry suggests, students treat syllabi more as End User License Agreements, skimming the first page or few paragraphs before clicking “agree to terms” and moving on without really reading the document. So what is to be done? The Graphic Syllabus and the Outcomes Map: Communicating Your Course is an accessible, engaging and thorough investigation of the use of graphic syllabi and outcome maps to engage students. Linda Nilson, author and founding director of the Office of Teaching Effectiveness and Innovation at Clemson University, contends that many syllabi are formulaic and read something like “Course BLAH 1010: Something I Gotta Take. Week One: Overview of Something I Gotta Take,” and so on. Her example stands as a humorous, but all too real, picture of how mechanical a traditional, text-based syllabus can be, and demonstrates how uninspiring academic language can appear to students. In response, Nilson recommends using a graphic syllabus (a.k.a. 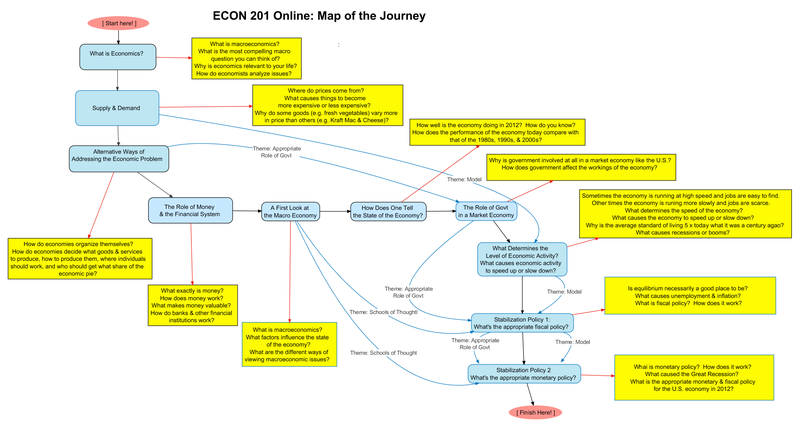 visual syllabus), which she defines as “a one-page diagram, flowchart or concept map of the topical organization of a course,” in combination with an outcomes map to sequence student learning objectives and outcomes. Two rather clever examples are shown above. But why a graphic syllabus? Why not just put the information in a list and connect the dots in class (as most of us do now)? Nilson argues that students, who are often “novices with little prior knowledge and disciplinary language,” fail to understand the course as a whole. The “patterns, generalizations, abstractions and algorithms” that underscore our thinking and make perfect sense to us as experts are foreign to them. She explains how “graphics facilitate learning” by allowing students to “dual-code” their learning into verbal and visual-spatial cognitive schema. However, it is important to keep in mind that graphic syllabi may be difficult to access for students with limited vision, especially those who rely on screen readers. Considering such, it is important to also offer a text-based syllabus and/or make use of the “alternative text for images” feature for graphics. Nilson suggests that faculty should more carefully consider their audience and meet them where they are, a fundamental principle underlying Universal Design for Learning. Nilson encourages ambitious instructors to use a “graphic metaphor” as an overarching theme within the syllabus. For example, the metaphor could be a floor plan (each lesson is a room), an ecological system (lessons interact with each other and show their interdependency), an exploded mechanical description (such as the engineering example above) or a four-course dinner (beginning with an appetizer and ending with coffee and brandy). However, if the thought of revising your entire syllabus is daunting, start small by adding graphic elements to your existing syllabus, such as the class schedule from an online Introduction to Sociology class (below), and progressively add graphic elements over several semesters. Or create a “course overview” that features the most pertinent information about the class (such as the Infographics course below), and post a full, text-based syllabus online. Fortunately, there are many websites and software programs available to assist you in your efforts (see resources below). Finally, it is suggested that the effort to create a graphic syllabus will benefit the instructor’s pedagogy as well as the students’ learning. Creating graphic syllabi can offer instructors an opportunity to rethink their courses in new and inventive ways, and many find the process liberating and creative. “In the end, they all had fun – the kind of fun that accrues from a creative activity that blends the mental with the emotional, freedom with structure and play with work. This is the type of activity that injects new life into college teaching” (Nilson 2007 p.231). Graphic Syllabus and Outcomes Map – New Additions to Your Fall Syllabus?